"To truly love each other and oneself is to love the Great Mystery of life"
I am Zhaawano Giizhik. 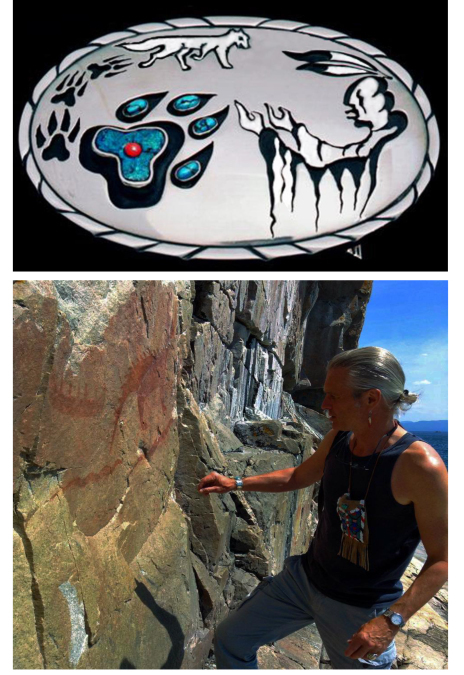 This blog story is the thirteenth already in a series titled Teachings Of The Eagle Feather, featuring my art (jewelry, mostly) along with works of art by kindred artists. Both my stories and the artworks displayed seek to provide an insight into the old and venerable worldview of the Anishinaabe Peoples. Today's story is inspired by amethyst, a beautiful gift from Mother Earth that enriches the world with its amazing purple luster, and by my most favorite person on earth, a woman from a faraway country in the East who stole my heart. Named after the legendary river Jordan she is a talented ballet dancer whose gracious dance movements remind me of an eagle in full flight. It is in her dark, lively eyes, her stories of wisdom, and in her gentle heart and the warmth of her smile that I found refuge and the true meaning of love. 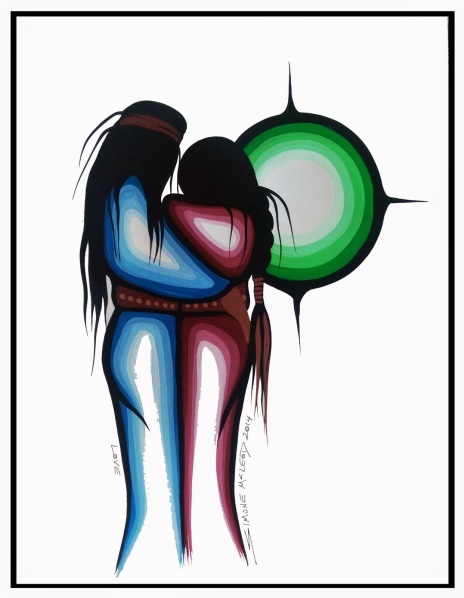 Another great source of inspiration is the work of my friend, the late second-generation Anishinaabe Medicine painter Moses Amik. 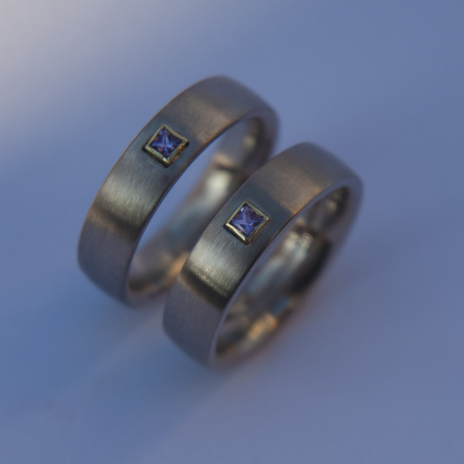 The story introduces a brand new set of wedding rings designed and handcrafted by myself. 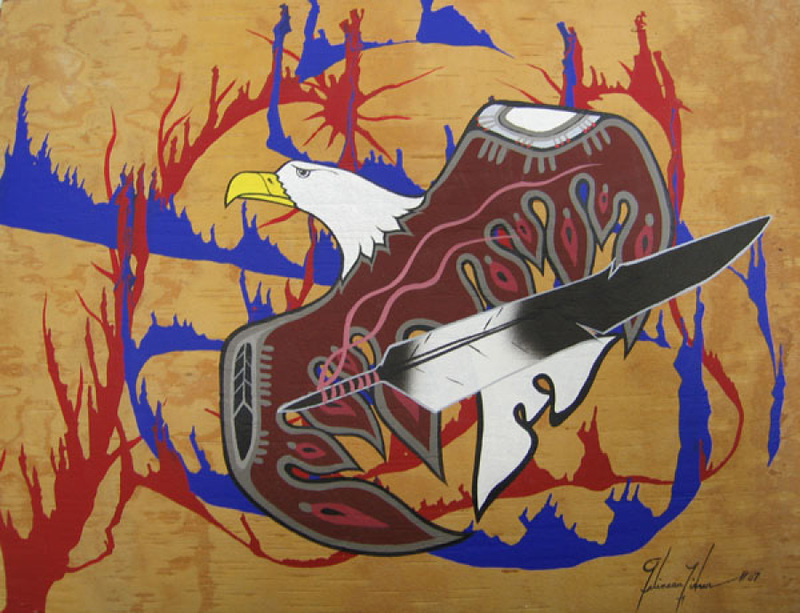 Also, a mixed-media acrylic by Moses, titled One Body One Spirit, and an untitled acrylic canvas by the late great Ojibwe painter Gelineau Fisher serve as illustrations for the story. 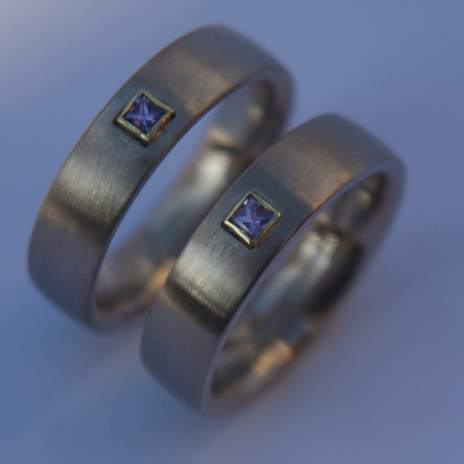 The unique wedding rings that you see here are titled Zaag’idiwin Onaanzigan; this is Anishinaabemowin (Ojibwe) for “The Color of Love.” Both rings, provided with a matte finish, are constructed of 14K palladium white gold and mounted with a 0.0787 x 0.0787 inch (2 x 2 mm) carré-cut amethyst. The magic luster of the purple stones, which are set in a bezel of yellow gold, refers to an important Teaching that belongs to a sacred set of guidelines of the Anishinaabe Peoples, often called Seven Grandfather Teachings. These Nizhwaaswi Gagiikwewinan are considered a part of Gichi-dibaakoniwewin, the Great Binding Law of the Great Mystery, and they became the foundation of Midewiwin spiritual practice. The Anishinaabe Midewiwin belief system is an age-old system of moralty, providing a code of ethics that is deeply rooted in the culture of all Anishinaabe Peoples of Turtle Island. Like Christianity summarizes morality in the Ten Commandments, the Midewiwin promotes the Seven Grandfather Teachings as a basis of what is called mino bimaadiziwin: living a good and upright life on a day-to-day basis. There is one difference though: unlike the Ten Commandments, the Seven Grandfather Teachings are guidelines rather than strict rules or dogmas. Purple, in Midewiwin tradition, is the color of ojichaag (the inner self) and naanaagadawenindizowin (introspection). It shows us where GICHI-MANIDOO, the Great Mystery, lives within us all. Purple reminds us that we as human beings are manidoowi; this means we are spritual beings in all aspects of life. Consequently, purple symbolizes first and foremost GICHI-MANIDOO itself, and at the same time it is the ultimate token of the love that we as human beings harbor for GICHI-MANIDOO. The yellow color of the gold bezels that hold the amethyst stones represent Waaban (the East), which is the direction from where Mishoomis Giizis (Grandfather Sun) rises in the morning to start his daily journey to the West. Yellow symbolizes therefore the path of life and new beginnings. The white color of the ring shanks, in conclusion, also refer to the direction of the East. The color white is considered in Midewiwin tradition as symbolic of Waaban-anang, the Morning Star, and of biidaaban, or daybreak. * Information provided by Beatrice Menasekwe Jackson, Migizi doodem (White-headed Eagle Clan). Giiwenh. 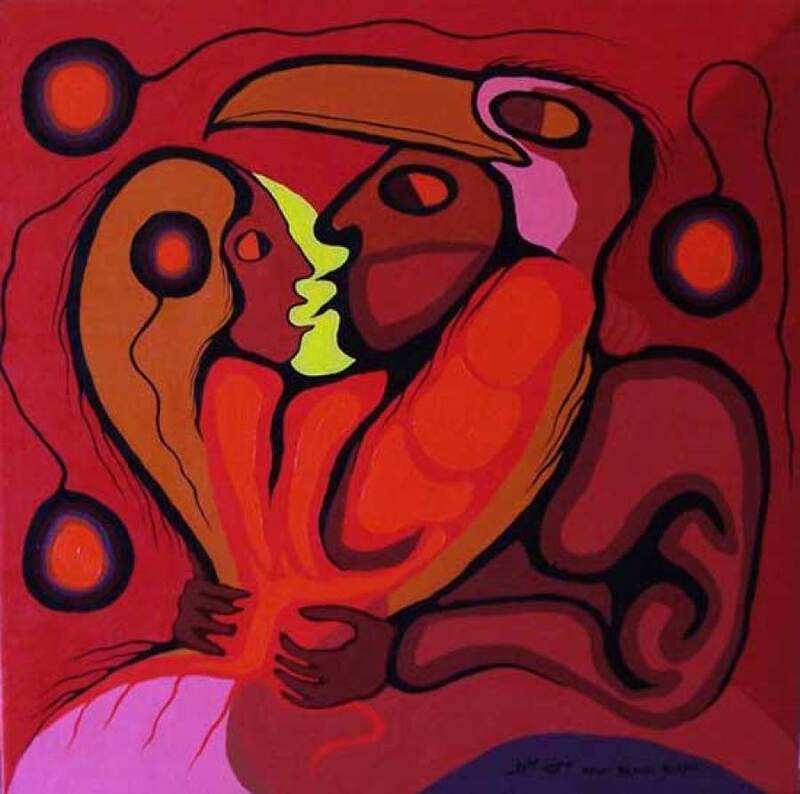 So the story goes about the old Anishinaabe Teaching of Love and the paintings of two of the most gifted Medicine Painters our People have brought forth... Such is the story of the woman who stole my heart; such is the story of my rings. Miigwech gibizindaw noongom mii dash gidaadizookoon. Thank you for listening to me today. Giga-waabamin wayiiba, I hope to see you again soon. Click here to read the first story in the Teachings of the Eagle Feather series, which centers around a set of wedding rings titled "Growth is a Mystery." Zhaawano Giizhik, an American currently living in the Netherlands, was born in 1959 in North Carolina, USA. Zhaawano has Anishinaabe blood running through his veins; the doodem of his ancestors from Baawitigong (Sault Ste. Marie, Upper Michigan) is Waabizheshi, Marten. As an artist and a writer and a jewelry designer, Zhaawano draws on the oral and pictorial traditions of his ancestors. For this he calls on his manidoo-minjimandamowin, or 'Spirit Memory'; which means he tries to remember the knowledge and the lessons of his ancestors. In doing so he sometimes works together with kindred artists. To Zhaawano's ancestors the MAZINAAJIMOWIN or ‘pictorial spirit writings’ - which are rich with symbolism and have been painted throughout history on rocks and etched on other sacred items such as copper and slate, birch bark and animal hide - were a form of spiritual as well as educational communication that gave structure and meaning to the cosmos that they felt they were an integral part of. Receive an email on blog updates.